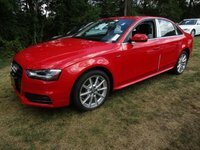 CarGurus has 4,608 nationwide A3 listings starting at $3,900. Audi’s “entry-level” offering adds features, functionality, and flair for 2016, just one year after a redesign. Audi seems focused on redefining entry-level luxury, continuing to add standard features to the already attractive package of the A3. With a well-sorted chassis, classy interior, and invigorating drivetrain, the A3 already made the competition nervous in 2015. Just a year later, a newly standard reversing camera, parking sensors, and heated washers and mirrors only underline that argument, and a new S Line appearance package means you can get some aggressive style without sacrificing usability. With average car weights sitting closer to 4 and even 5,000 pounds, the agility of a vehicle that leans closer to 3 can be a surprising thing. In fact, it’s likely the first thing you’ll notice when slipping behind the wheel of the A3, and it’s comforting to find that you can still have that sort of responsiveness without a dangerously low and uncomfortably stiff suspension. The A3 is truly usable as well as fun to drive with 5 seats, up to 4 doors, a real (albeit small) trunk, and good visibility as well. 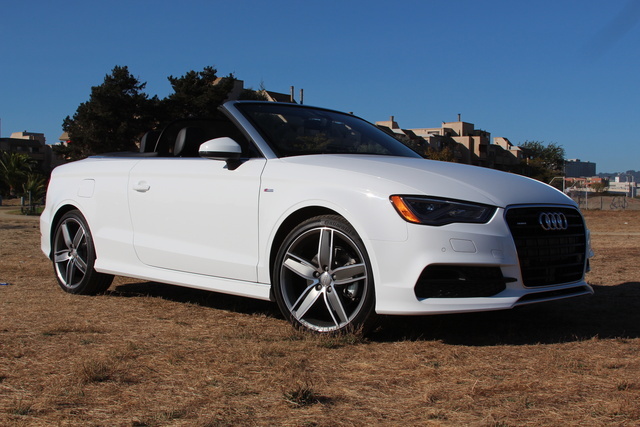 Pick your poison, because you can have the A3 as a 4-door, 5-seat sedan or a 2-door, 4-seat cabriolet with one of three engines and front- or all-wheel drive (FWD or AWD). Starting at the base Premium trim level, the A3 offers luxury standards like 17-inch alloy wheels, cruise control, leather, power seats, dual-zone auto climate controls, and a 10-speaker stereo with satellite and HD Radio. 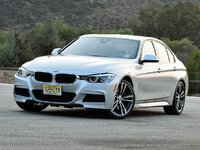 But what might surprise you at its $30,900 MSRP are features like automatic xenon headlights and LED running lights, auto wipers, a panoramic sunroof in the sedan, the MMI interface with retractable display, and of course the 2016 additions mentioned above. Additionally, the interior materials and construction seem to betray the price, besting offerings that cost more than twice as much in other categories. The switchgear is a special standout, with none of the cheap feel that can often ruin an otherwise pleasant interior. But that will get you the 1.8-liter engine, and while it’s a competent mill, it would be well worth it to jump up to the 2.0-liter option for all the extra power and pleasure. For some extra luxury, the Premium Plus trim ($33,600) adds 18-inch wheels, heated front seats, power for the front passenger seat, and an auto-dimming rear-view mirror, plus keyless entry and ignition. I think these features will convince many to jump up to this mid-level trim, but this is also where you get the frustrating proprietary iPhone interface and cable that should’ve been left behind years ago. It’s the one glaring soft spot on this otherwise shiny apple. Luckily you can add these features to the Premium trim à la carte and avoid it altogether, one of my favorite parts of the Audi lineup. You can also add a sport suspension here for just $250, and that’s hard to pass up, but perhaps even better is the full Sport package for $650 that’ll get you the sport suspension, sport seats, a flat-bottom steering wheel with paddle shifters, and adjustable performance. This can also be added to the top-tier Prestige trim, which boasts all the technological goodies the A3 can offer: adaptive cruise, Audi Pre-Sense with collision-avoidance braking, lane-keep assist, and the Tech package, which adds an upgraded MMI system, navigation, 4G LTE Wi-Fi hotspot, voice controls, configurable digital gauges, and a 14-speaker Bang & Olufsen stereo. The Tech package can again be added to the lower trims, although the base Premium will have to sacrifice the lane-keep assist. Beyond the tech, the Prestige also gets an S Line appearance package that will be available on Premium Plus trims in 2017, LED lights inside and out, and power-folding mirrors, both of which can be added to the Premium Plus this year. 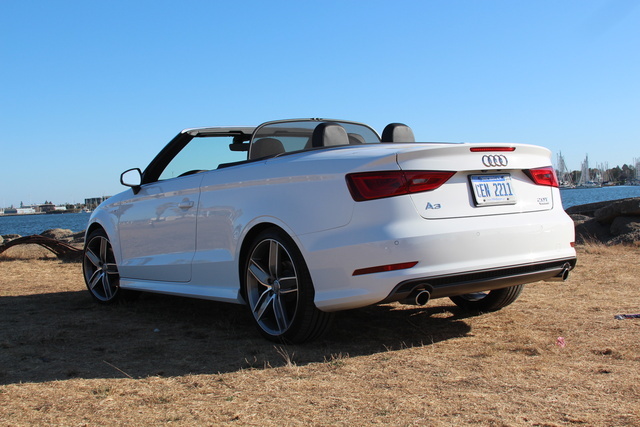 My week with the A3 was spent in an AWD cabriolet with a base price of $39,600 with the $8,850 Prestige package. 19-inch titanium-finish wheels with summer tires added $800, and with the $250 sport suspension and $925 destination, the drive-away price pushed just past 50 grand at $50,425. The A3 is based on the same familiar (and increasingly ubiquitous) MQB platform as the Audi TT & Q2, the Volkswagen Golf, Passat, Touran, and Tiguan, plus many Škodas and SEATs. It’s tight, responsive, and as that long list displays, quite versatile. Set it up with FWD and the standard suspension, and it’s supple without being sloppy. Screw it down with AWD and the sport suspension, and it delivers agility without destroying kidneys and backs over every rut and ripple. The flickability of this platform can’t be overstated, especially when considering the price and purpose—to get better, you’re going to have to start sacrificing everyday usability. Starting with the 1.8-liter engine, the A3 is working with 170 hp and 200 lb-ft of torque and is available only in the FWD configuration. This turbocharged mill will propel the A3 to 60 mph in around 7.2 seconds with quite a bit of lag, although it must be stated that this still isn’t slow by any means. And while EPA estimates of 27 mpg combined come from a calculated 23 mpg city and 33 highway in the sedan, moving up to the turbo 2.0-liter engine will actually gain you 1 mpg around the city if you stay with FWD. Of course, you gain more than just that 1 mpg. You also get 50 more hp and 58 lb-ft of torque, and that certainly can be felt. It’ll lop more than a second off the sprint to 60 and eliminates much of the turbo lag felt with the 1.8. Even if you move to the heavier convertible and its required AWD, you’ll still get 23 mpg city and 32 highway for a combined rating of 26 that’s easily achievable even with some spirited driving thrown into the mix. And you’ll definitely want to throw that in, because with the quattro AWD system and all that extra torque, it’s hard to find the limit of grip on public roads. Allow yourself to venture close to the 6,050-rpm redline and you’ll be rewarded by an aggressively non-linear powerband that will remind you what forced induction can do. If you’re really feeling brave, or particularly trustworthy, there’s a 2.0-liter turbodiesel option that offers 150 hp and 236 lb-ft. It’s the slowest of the bunch, taking 8.3 seconds to reach 60 mph, although the generous torque makes it feel deceptively faster than the numbers. And speaking of deceptive numbers, EPA estimates for the turbodiesel fall at an impressive 36 mpg combined, with 31 mpg city and 43 highway, if those can be believed. 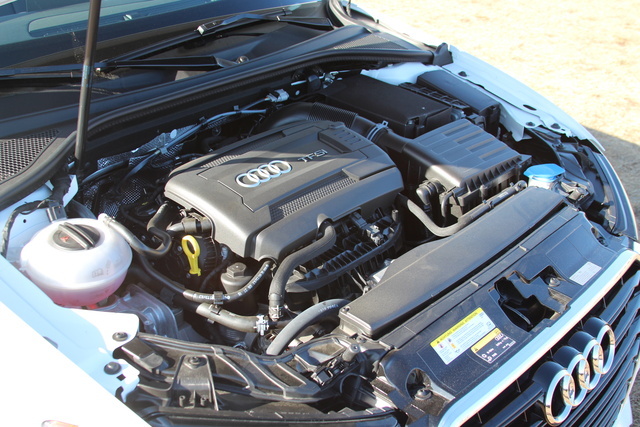 This engine can be had only in the sedan and only with AWD. Regardless of engine, drive configuration, or roof, every A3 comes with a 6-speed automated manual, despite the Golf GTI and R offering a traditional manual with the same engine. Thankfully it’s a great transmission despite 6 speeds quickly feeling antiquated in an industry where 7, 8, and even 9 cogs are becoming more common. Go for the Sport package and you’ll get configurable settings that’ll hold shifts longer and paddle shifters that mean you won’t have to take your hands off the wheel for quick downshifts during highway passing maneuvers. I’ve never liked them much for spirited driving, however, so it’s a good thing that the transmission is up to the task of keeping you in the right gear while canyon carving. It has to be said: There are few cars on the road that will deliver an equivalent level of interior quality for the same price as the Audi A3. So many vehicles I test seem to forget that you’re spending most of your time in the driver’s seat, not on the outside, and the overall look and feel of the car from that perspective is most important. The pieces you’re going to touch need to communicate the level of quality the car is meant to represent, and the A3 exceeds expectations. Soft-touch surfaces are complemented by harder applications that never seem to feel cheap, and it’s the switchgear that’s a particular pleasure. It’s very frustrating to have an “upscale” trim or model get increased leather and metal or wood trim but still leave the cheaper switchgear in place. That’s what you’re touching, so that’s what you’ll remember. Here every switch feels solid and “looks” luxury, more so than many vehicles I’ve tested that cost more than twice as much. But this is a compact vehicle, so don’t expect a giant backseat or trunk. 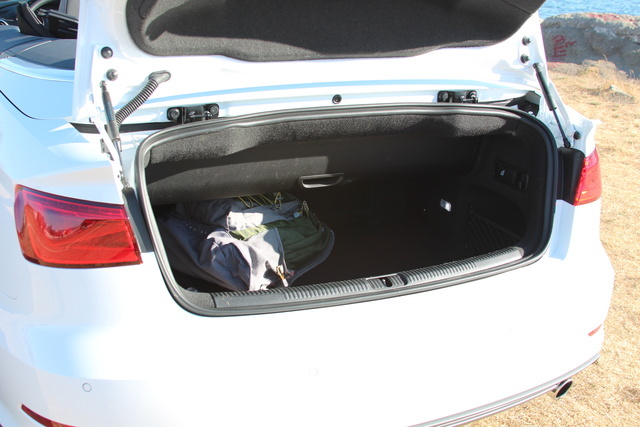 Adults can definitely fit in the rear, at least in the sedan, but they’re not going to be happy there for a longer trip, and in the convertible the rear is best left to children and luggage. Speaking of which, it’s a compact trunk, too. If you go with FWD, you’re looking at just 12.3 cubic feet, and if AWD is your preference, that will fall to a flat 10. The good news is that if drop-top motoring piques your interest, you’ll still get 9.9 in the convertible. I love that the A3 can be fitted with nearly every tech feature regardless of trim level, and there’s plenty to check out here. The standard MMI interface is one of my favorites on the market, and the upgraded version with the touch-sensitive rotary dial is intuitive and easy to use. I usually write with my left hand, and I still had no trouble drawing inputs on the top of the dial with my right. Better still, the rotary is quick enough that you don’t even need to draw if you don’t like that feature. 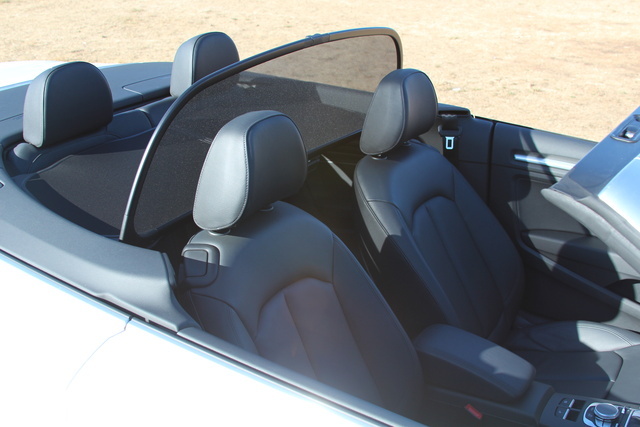 The 10-speaker stereo that comes standard is more than up to the task in the sedan, but the 14-speaker Bang & Olufsen really helps in the convertible when the top is down. The Tech package that adds the upgraded MMI and gauges, the B&O stereo, navigation, voice controls, and Wi-Fi hotspot are definitely nice, but consider how you’re going to use things like your phone and tablet before you add another $3,000 to your purchase price. It’s not that it all isn’t useful, but for the price I think a lot of people would find they could live without it. Plus, the A3 will be getting Apple CarPlay and Android Auto in 2017, replacing a lot of functionality. The big tech showing here is in the safety department. Lane-keep assist, adaptive cruise, and collision-avoidance braking via Audi Pre-Sense mean you’ll have a hard time getting into an accident, but it must be noted that the automatic braking activated on me in the middle of an intersection as I was crossing over a construction plate in the road. As I got closer it recognized that we were not about to experience an imminent collision and deactivated, but I still came very close to being rear-ended. The system seems to have some bugs to work out, it seems, and after that experience I deactivated the collision-avoidance braking. Beyond the safety tech mentioned above, the A3 comes with standard stability and traction control, 4-wheel antilock discs, the new front and rear parking sensors, a reversing camera, and a full suite of airbags including front knee, front side, and full-length side curtain bags. Sedans can additionally be fitted with rear side bags, and depending on configuration and tires, the A3 will come to a stop from 60 mph in anywhere from 120 down to a stunning 105 feet. All of this helps the A3 achieve a top, 5-star rating in overall government crash tests, with only total front-impacts receiving a lower 4-star rating. Independent testing from the Insurance Institute for Highway Safety saw top scores across the board, including for seat and head restraints with regard to mitigating whiplash. Go for the A3 with FWD and the 1.8-liter engine, and you’ll be hard-pressed to find a better deal for the money at just over $30K. If you want to splurge and push the price past $50K for a Prestige convertible with AWD, I still think you’ll be happy. That said, a Golf GTI or Golf R for less money and even more power in the R is an even better deal, given that it’s the same platform and drivetrain with the added benefits of hatchback design and a three-pedal manual. Simply put, the A3 offers one of the best interiors on the market, and that’s something that’ll continue to please long after the exterior becomes dated. Resale will likely be hurt somewhat by Volkswagen Group’s continued troubles with their turbodiesel powerplants, but only time will tell by how much, and obviously that will be grossly weighted toward vehicles fitted with the TDI engines. Currently, Audi is offering special rates for financing through Audi Financial Services, but this lasts only until Halloween. 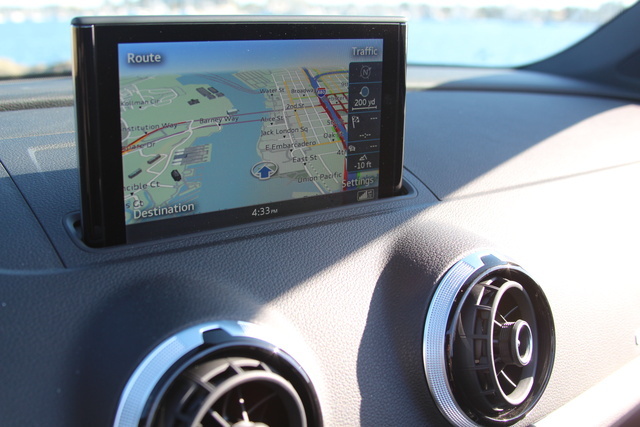 Given the extras like Apple CarPlay, Android Auto, and some trim and feature reshuffles that are coming in 2017, it may be in your best interest to wait. 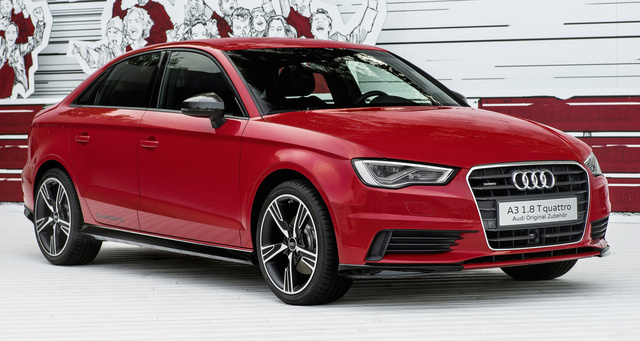 What's your take on the 2016 Audi A3? Have you driven a 2016 Audi A3? My question is the cost of the famous Audi maintenance will break me. I would of course buy a 2 3 year old with a 2 year warranty.